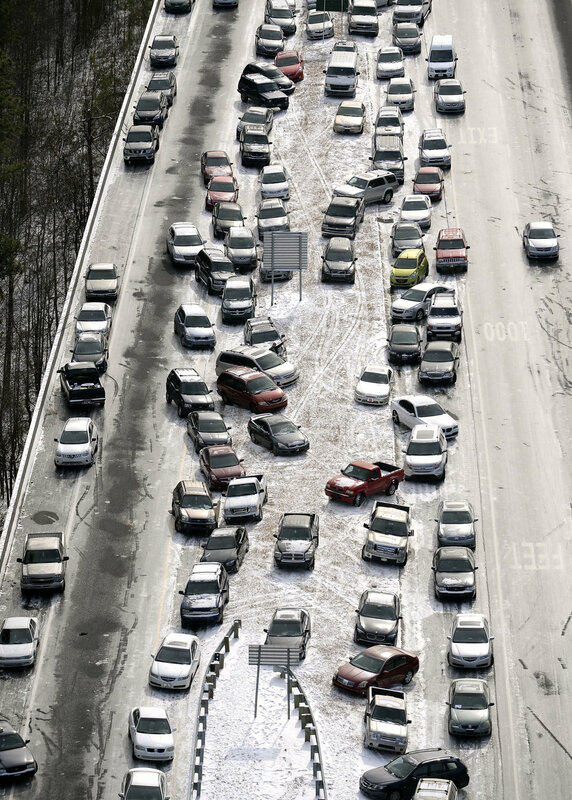 We here in Atlanta, Georgia are digging out from the unbelievable experience of Snow Gridlock 2014. On Tuesday, January 28, 2014, many Atlantans, who normally had a commute of 30 minutes or so, found themselves stuck in a nightmarish gridlock that super-sized their commute to 12 hours or even more, as they attempted to leave the city at the same time that the other 1.2 Million citizens did. The result: an utter disaster. The Governor of Georgia, Governor Nathan Deal, issued an official “state of emergency” for the State of Georgia. And not a minute too soon. Many people were forced to abandon their vehicles on the side of the road, because they ran out of gasoline or simply because their drivers at some point faced up to the harsh reality that it was better to abandon ship and attempt to find warm shelter on foot. Now, while some much-needed sunshine melts the ice from our streets, the aftermath of nearly 2,000 abandoned cars is setting in. The owners of these cars are in the process today of trying to remember where they left their cars and driving them home. That is, of course, if they haven’t already been towed away. First, the communications director of the Georgia Department of Transportation simply announced the State would begin towing abandoned cars so the GDOT equipment trucks could deice and plow the roads, particularly the Interstate Highways. In this first notice she unceremoniously announced it was unclear whether owners (who had smartly abandonded their cars) would be responsible for paying to retrieve their cars from tow lots. Brilliant! Then yesterday, the GDOT softens a bit and announces they will just tow abandoned cars to the side of the road and leave them there. This would allow the plowing and deicing trucks to pass. Finally, today, the GDOT says it will actually drive car owners to their cars so they may drive them home. Again, I say Brilliant! I raise all of this to let you know, in case you weren’t thinking about this, that should the tow company negligently tow and damage your car, or really, if the towing company nearly intentionally damages your car while towing it, they get a free walk. That’s right…nearly complete immunity for any damages they cause to your car. Why? Because the Governor declared a “state of emergency,” which sounds uber-scary just by itself, but when you add to it all of the things that can now occur freely and without accountability, it’s a potential horror story. Last year, the Georgia General Assembly passed a bill that gives complete and total immunity to any towing company that is towing a car during a “state of emergency.” The law can be found at O.C.G.A. Section 32-6-4 which states: State or local law enforcement officers, including fire department officials, and the department are authorized, upon the issuance of an executive order by the Governor declaring a state of emergency, with or without the consent of the owner, to remove or have removed any natural or manmade obstruction, cargo, or other personal property which is abandoned, unattended, or damaged and the law enforcement officer or the department determines such object to be a threat to public health or safety or to be contributing to traffic congestion. Any person, contractor, towing service, or other entity that is removing an obstruction, cargo, or other personal property pursuant to the instruction of a law enforcement officer, an official of a fire department acting under the authority of paragraph (1) of Code Section 25-3-1 or paragraph (3) of Code Section 25-3-2, or the department, and under the provisions of this Code section, shall be liable for damage or harm at the location where the obstruction, cargo, or other personal property was left abandoned or unattended, only when the person, contractor, towing service, or other entity was grossly negligent in the performance of his or her assigned duties; provided, however, nothing in this Code section shall limit liability for any damage or harm caused at a location different from the location where the obstruction, cargo, or other personal property was left abandoned or unattended. Now, I’m not saying this is necessarily a bad thing, right? I mean, after all, we’re in a “state of emergency,” right? Right. Maybe tow trucks really should enjoy almost complete immunity for whatever they do wrong during a “state of emergency.” I raise the issue, however, to point out that it seems these days everyone wants immunity for everything. It seems like any new bill introduced in the Georgia General Assembly always attempts to offer immunity to somebody for something. The Georgia General Assembly is predominantly comprised of conservative, right-sided Republicans. And to them, and all of you, I ask: Since when did accountability for one’s actions become anti-conservative? Why the insistence by these Republican legislators to grant nearly complete immunity to anyone who might be held accountable for wrongdoing? I thought accountability, taking responsibility for one’s own actions, was a conservative value? What is going on here? You may have seen some news articles about a new car that can drive itself. There may even be an effort to bring such self-driving car manufacturers to Georgia. But, I can assure you, that somewhere along the way some Georgia Legislator will attempt to secure immunity for car manufacturers under the guise it will bring manufacturing jobs to Georgia. This would be a nightmare. Cars are as safe as they are now, including seatbelts, back-up cameras, electronic stability control, no side-bag fuel tanks, etc., because trial lawyers, through painstaking individual lawsuits, dared to hold these mighty corporations accountable with the smallest form of self-government ever devised: an American Jury. If we don’t stop eroding our citizens’ rights now, one day it may be you, or your family member, who is injured through no fault of your own but who has no recourse at law because of immunity being given to anyone who asks for it now.